M2-48 Eden Tower, Main Boulevard, Gulberg-III, Lahore. 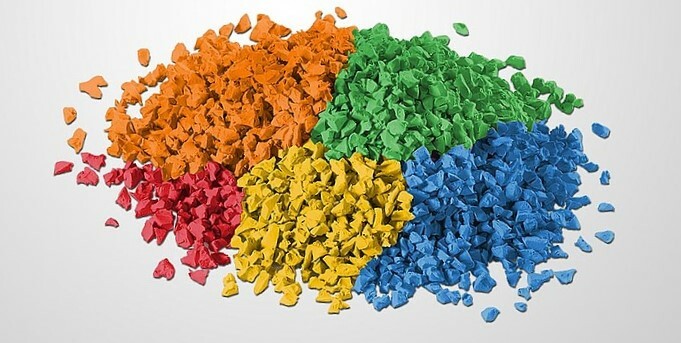 With environmental protection, beautiful appearance, safety, wear resistance, shock absorption, anti-uv and other advantages, EPDM Rubber granules are the best plastic ground material currently. Widely used in all kinds of runway, kindergarten, park path, children’s playground and other venues. In Europe and the United States, The rubber content requirement of EPDM rubber playground is usually more than 15%, the domestic is usually 8%-10%. The higher the content of EPDM Rubber Granule, the higher the cost will be. Also, the performance of the playground will be better. After the interception of vulcanized EPDM sheet, then place it on the clamping device of the testing machine , and transferred it to a symmetrical position carefully, in order to make the tensile evenly distributed in the cross section of the specimen. Write down the distance between the largest and the two line inside when the boot test piece fractured. EPDM Granules are of good tensile properties, more durable, and long service. Under the set temperature and humidity condition, the use of machine simulation of normal solar UV irradiated EPDM rubber block, namely artificial simulated climate, achieve the set time, and related physical properties of observation for EPDM rubber color changes, called EPDM anti-aging performance test. Under normal weather condition, the strong performance of anti-aging of EPDM Granules are not easy to fade. The color of the EPDM playground is more durable, stable, and longer. GARGHASH GROUP understands the importance of delivering superior-quality building, site and infrastructure construction on schedule and within budget. Our knowledgeable, experienced Construction Services team other than construction can also provides part-time and full-time resident observation to report daily activities, monitor work progress for scheduled compliance and troubleshoot construction issues as they occur always with a keen eye on timelines and the bottom line. M2-68 Eden Tower,main Boulevard, Gulberg-III, Lahore.